You are currently browsing the tag archive for the ‘Self-Help’ tag. 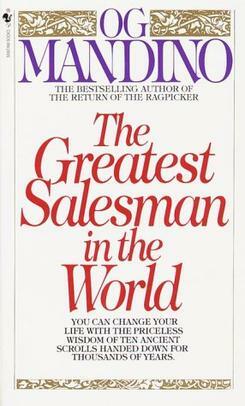 I just finished reading an interesting book, “The Greatest Salesman in the World” by Og Mandino. Its Chinese translation was marketed in the name “Scrolls of Wealth” in China and was very popular. I didn’t realize it was published just 40 years ago in 1968, a best-seller since then, until I read some critics about the book. The story of the book was set in biblical time in Arabic world. It’s about a poor camel boy, Hafid, who eventually became the greatest salesman in his time with unmatchable wealth. However, I can see the story is just a “make-up”, like all the stories in the TV advertisements. Essentially, the author would like to sell his “manuals for salesman”, which he developed for his insurance company while working in rural New Hampshire, as he disclosed in the preface of the book. The author is indeed a very good salesman for his ideas. The story is catching, persuasive, full of drama, even having a mysterious link to the Bible. Obviously, he followed his own advices to sell, capturing people’s interests, making connections through familiarity (Bible story), demonstrating success stories happened with other ordinary people, and making the items for sale seems scarce and rare thus valuable. Another interesting way he did his selling is to command the reader to read each principle (a chapter or scroll in the book) three times a day for a month. That’s almost like a religious practice. I have to agree it’s the best way to build the principles into habits. I recommend a good book about dealing with the change. You may already read this little interesting book. Only takes 1 hour to finish, “Who Moved My Cheese“. Hope it can help us to survive the constant changes and achieve greater success in our life! My life is fundamentally changed after I read Dr. Stephen Covey’s awesome book, “The 7 Habits of Highly Effective People“. A lot of positive things happened. I feel happy in life and more important, I feel I am in charge of my own life. Nothing feels better than that! One of the concept I learned from the book is if one really wants to learn the materials and would like to apply them to achieve good results in life, the best way is to teach the materials to other people. From my past experience, I know that’s absolutely true. “Knowing, but not doing, is not knowing”. Another concept learned. So, here is my action. I prepared a series presentations to help me teaching other people, “7 Habits”. I will post them here in a series of posts. It starts from talking about the problems we are facing and how to solve them by changing the way we see the problems. I will love to share the experiences of applying 7 habits with any one who is interested in fundamental life changes.